Home › Home and Kitchen › Wine Opener Wine Key - Set Of Three Double Hinged Cork Screw By Hqy- Wine Key..
Wine Opener Wine Key - Set Of Three Double Hinged Cork Screw By Hqy- Wine Key..
Wine Opener Wine Key - Set Of Three Double Hinged Cork Screw by HQY- Wine Keys In Assorted Trendy Colors - Foil Knife And Reinforced Steel Screw - Wine Bottle & Beer Bottle Opener In One! 1 "HQY" is a famous registered brand in the US. 2 STAGE PULLING HINGE MECHANISM for better leverage and softer removal of short and long corks. Latest proven technique applied to minimize the force required. 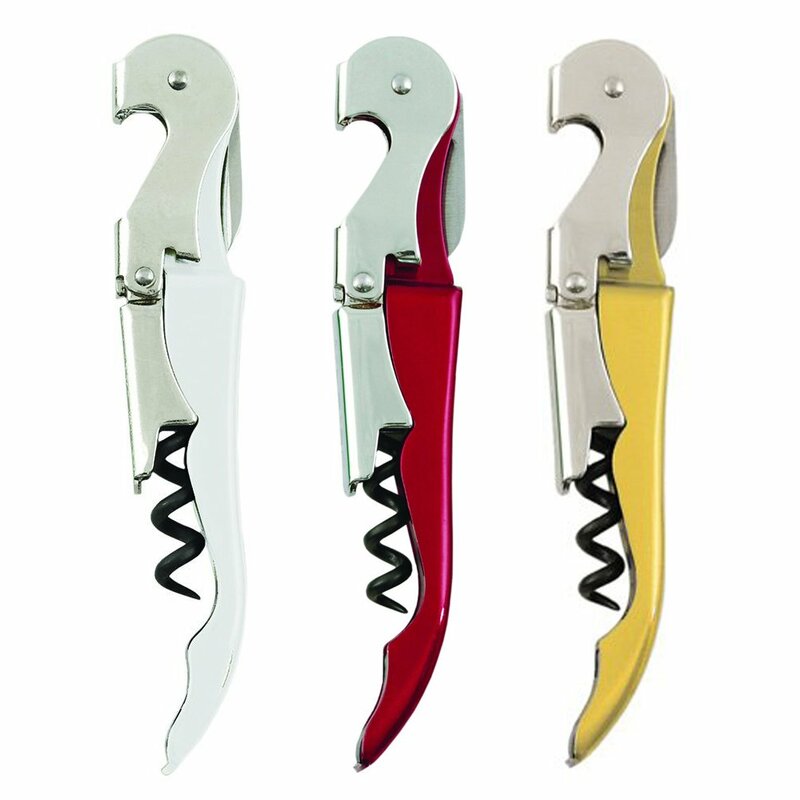 3 IN 1 MULTI-FUNCTION OPENER best known as the Waiters Corkscrew. Equipped with corkscrew, bottle opener and a serrated cutter for removing the top foil. 100% MANUFACTURER's WARRANTY: We stand behind our products with a complete, lifetime guarantee. If something breaks or if you don't absolutely love your new Waiters Corkscrew, we will take it back and offer a replacement or refund, no questions asked. That is part of our 100% LIFETIME CUSTOMER SATISFACTION GUARANTEE!!! Color:Corkscrew Yellow-White-Red ◆Wine Opener Wine Key - Set Of Three DoubleHinged Cork Screw by HQY - Wine Keys In Assorted Trendy Colors - Foil KnifeAnd Reinforced Steel Screw - Wine Bottle & Beer Bottle Opener In One! Pros: -assorted colors - sturdy - double hinges -heavy duty stainless steel forsurface protection - serrated foil cutter - inexpensive price - speedyshipping - great customer service ◆Customer Voice ◆Attractive and beautifullyfunctional wine bottle cork removers. ◆By Scientist in San Francisco ◆Thesewine openers are attractive and beautifully functional. The corkscrew is verysharp, and the hooks onto the bottle rim are perfectly placed. These twofeatures combine to make it easy to open any wine bottle quickly using littlestrength or effort. I bought these only because my much loved, heavy, andexpensive rabbit had broken after many years, but these light and convenientwine openers are even easier to use. Having three of them is convenient,leaving one in each of the places that they are used. The foil cutter is notquite as convenient as the circular wheel cutter that came with the rabbit,but, unlike that one, the blade that cuts the foil is attached to the openerand can not be lost. ◆Love this opener By Pen Name Anyone with arthritis orother hand problems will love this opener. Two twists and the cork pops outwith little effort. Highly recommend this brand with the double hinge.